Install remote control adaptor kit on Johnson 4-Stroke 25 HP (32.8 cu. in. / 538 cc) outboards. DO NOT install on any other models. 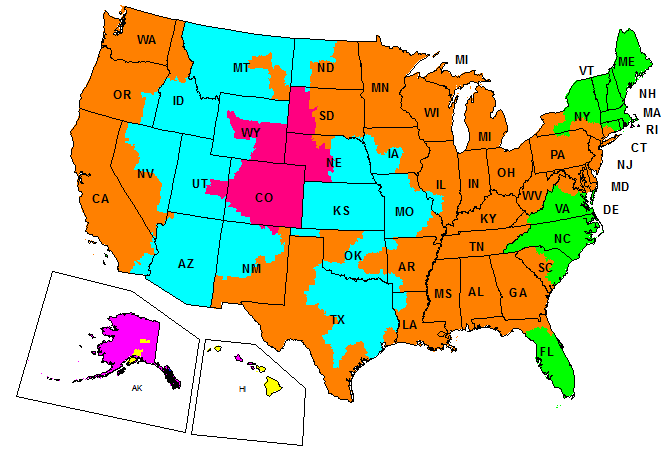 Refer to service manual and installation guides for additional assembly information. Read and familiarize yourself with the complete installation instructions of the remote control adaptor kit. Always test the operation of remote controls once installed. Failure to properly install and test remote control may result in remote control malfunction and loss of control of boat. 1) Remove lower covers and flywheel cover. 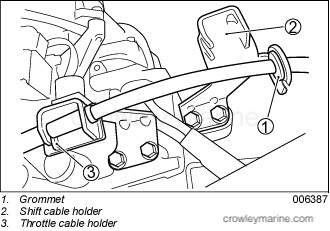 2) Disconnect throttle cable ends from carburetor. 3) Disconnect the engine stop switch wiring from the tiller handle bracket. 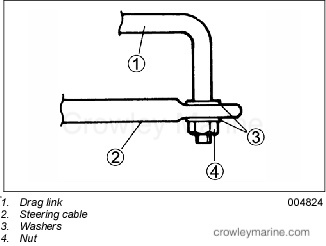 4) Remove the tiller handle assembly from the outboard. 5) Disconnect the shift lever link from the shift shaft. 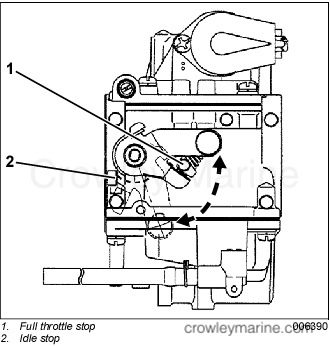 Remove the shift lever from the outboard. 6) Remove the cable grommet and the start switch from lower cover panel. 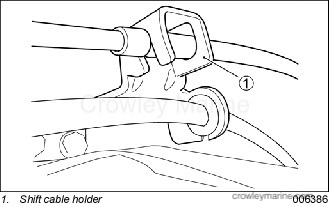 7) Remove the adjuster lever assembly and the steering friction plate from the steering bracket. 8) Note the wire harness routing and connections. Remove the wiring harness. Install the plug in the lower cover panel to seal start switch hole. 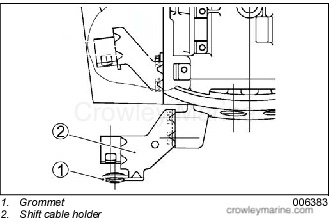 Assemble the throttle control lever, the throttle lever spring, and the throttle interlink lever. 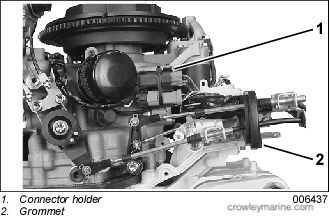 Install the assembly on the engine block using the throttle lever bolt and washer. Torque bolt to 100 in. lbs. (11 ± 2.0 Nm). Insert one end of the shift lever link end into the shift shaft. Insert the opposite end of the shift lever link into the hole of the clutch lever. 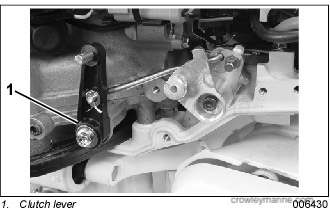 Install a washer and a cotter pin on each end of the link. Install the clutch lever on the cylinder block using spacer, washer and bolt. Torque the bolt to 100 in. lbs. (11 ± 2.0 Nm). 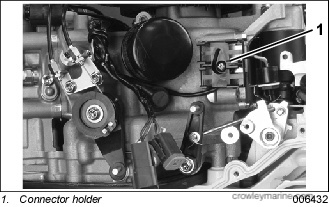 Install the throttle cable stay on the cylinder block using two bolts and torque to 100 in. lbs. (11 ± 2.0 Nm). 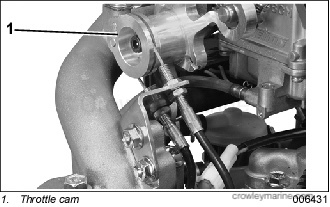 Install the non-adjustable ends of the throttle cables on the throttle lever and the adjustable ends of the throttle cables on the throttle cam. Position cables in the throttle cable stays. Install the wire harness connector holder on the cylinder block. Install the connectors of the wire harness assembly on the connector holder. Install the wire harness assembly following the original routing and connections. Refer to chart below. Clamp the wire harness in the same position as the original harness. IMPORTANT: Route wire harness carefully. Do not allow wire harness to contact moving components or to rub against sharp surfaces. IMPORTANT: Before connecting the remote control cables to the engine, the cables must be properly installed in the remote control assembly. Refer to installation instructions for remote control. Insert the remote control cable grommet into the shift cable holder. Install the shift cable holder (with the grommet) on the lower cover panel using two bolts and torque to 88 in. lbs. (10 ± 2.0 Nm). Route the shift cable through the shift cable holder. Position the groove of the cable in the retaining slot of the holder. Position cable grommet for the lower engine cover on the remote control cables as shown. 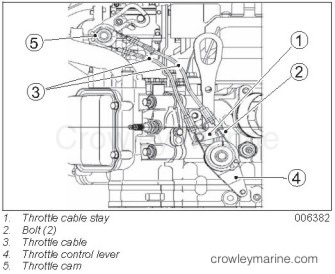 IMPORTANT: Remote control throttle cable must not be connected to throttle control lever. 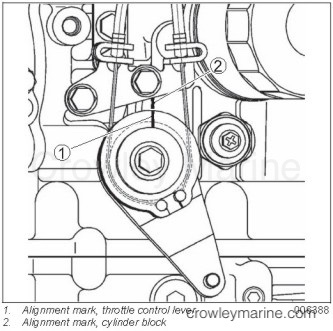 Align the alignment mark on the throttle control lever with the rib on the cylinder block. Keep lever in this position. 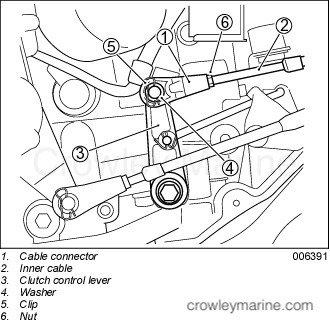 IMPORTANT: Adjust throttle linkage cables to remove all slack from cables with all alignment marks aligned as shown. 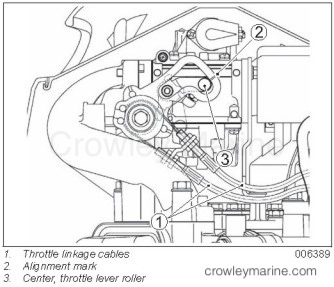 Throttle lever must be in IDLE or slowest throttle position and aligned with the rib on the cylinder block. 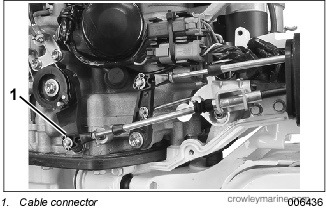 Adjust the lengths of the throttle linkage cables to align the alignment mark on the throttle cam with the center of the throttle lever roller. IMPORTANT: The cable connector must thread onto threaded end of cable a minimum of 0.5 in. (13 mm). Install the cable connector onto the threaded end of the remote control cable. Screw connector in or out with the inner cable fully pulled out. Align the hole of the connector with the pin of the throttle control lever. Position the cable connector on the pin with flat surface of connector toward cylinder block. Install the washer and clip. Tighten the cable nut against the connector. 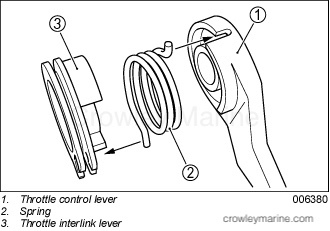 Make sure the throttle lever of the carburetor contacts the full throttle stop when the remote control lever is advanced to FULL THROTTLE or highest throttle position and contacts the idle stop when the remote control lever is returned to IDLE or slowest throttle position. Make sure the remote control is in NEUTRAL. 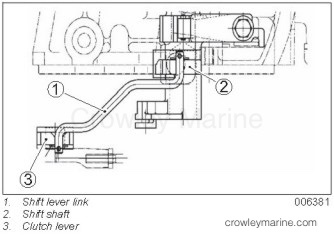 Turn propeller shaft and move the clutch control lever (shift lever). 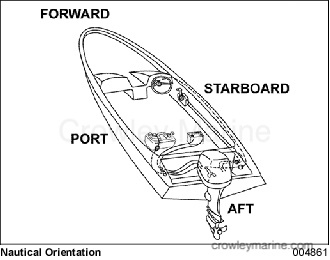 Shift outboard between FORWARD, NEUTRAL and REVERSE. Position lever in NEUTRAL. 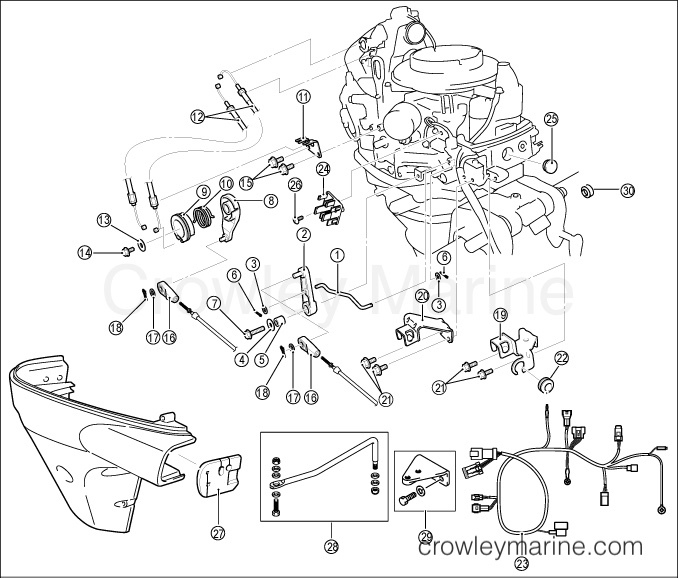 Make sure outboard is in NEUTRAL and propeller shaft turns freely. Install the cable connector onto the threaded end of the remote control cable. Screw connector in or out with the inner cable fully pushed in. Align the hole of the connector with the pin of the clutch control lever. Position the cable connector on the pin with flat surface of connector towards cylinder block. Install the washer and clip. Tighten the cable nut against the connector. Turn propeller shaft and check shift operation. Make sure the shift lever moves the clutch to engage the forward and reverse gears completely. IMPORTANT: Make sure the neutral switch is depressed when the remote control lever is in neutral position. Extend the output end of the steering cable and lubricate the inner core and sliding surfaces of cable with Triple-Guard grease. Install steering cable through tilt tube and tighten the retaining nut. 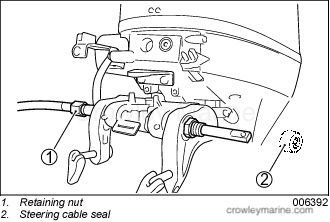 Install steering cable seal. 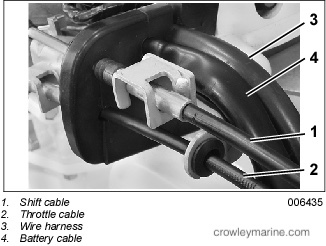 Connect drag link to the steering cable with washers and self-locking nut as shown. Tighten the nut to 88 in. lbs. (10 Nm), then back the nut off 1/8 of a turn. Move the steering cable until hole of drag link aligns with the rear hole on the steering bracket. Connect the drag link to rear hole of bracket using the bolt, spacer, and washers as shown. Torque the bolt to 25 ft. lbs. (34 Nm). Install self-locking nut and torque to 25 ft. lbs. (34 Nm). IMPORTANT: After assembly, turn the steering wheel all the way to PORT and to STARBOARD to check for smooth and unrestricted steering operation. 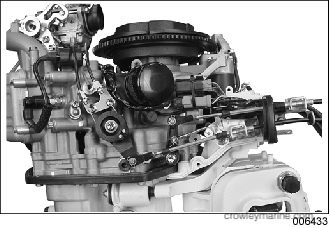 Connect the remote wire harness to the connectors of the engine wire harness assembly. Position the connectors in the holder. Route the remote control wire harness through the cable grommet. Reinstall flywheel cover and lower covers. Use this “non running” test to make certain the starter motor will NOT operate when control lever is in FORWARD or REVERSE. The lanyard clip may be attached to key switch or removed for the following test. IMPORTANT: Disconnect all spark plug wires to prevent outboard from starting during test procedure. With control handle in NEUTRAL position, turn key switch to START. The starter should operate. With the key switch in START position and the starter cranking the engine, move control handle to FORWARD. The starter should stop as handle leaves NEUTRAL. Release key and move control handle to NEUTRAL. Turn key to START. The starter should operate. With key switch in START position and the starter cranking the engine, move control handle to REVERSE. The starter should stop as handle leaves NEUTRAL. Start the engine and check shift and throttle control operation by moving the remote control lever to FORWARD and then REVERSE position. Check emergency stop function. 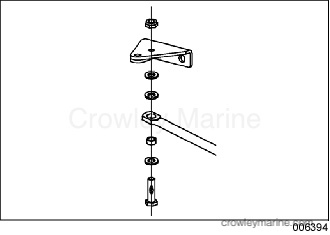 With outboard running at IDLE, pull safety lanyard from emergency stop switch. Outboard must stop immediately. Make sure throttle advances to FULL THROTTLE position and returns to IDLE or slow speed position and operates smoothly. Apply Triple-Guard grease to all moving parts, including throttle cables, the throttle lever, and the throttle drum.